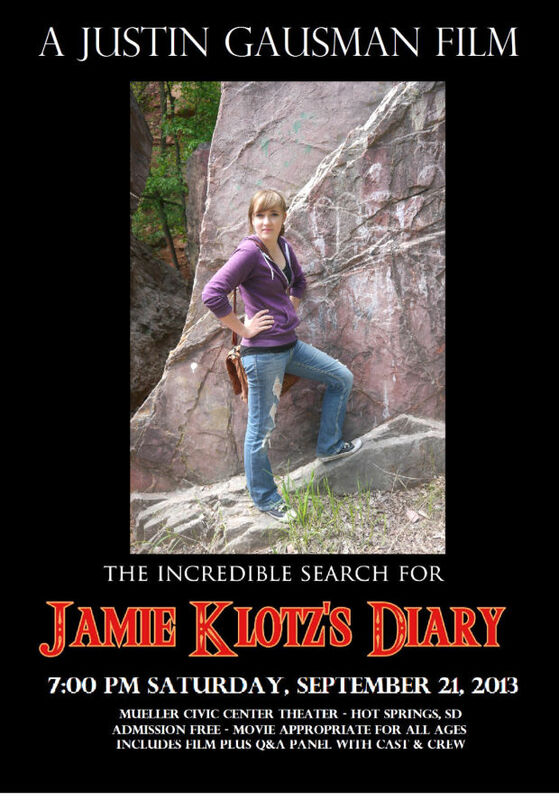 HOT SPRINGS – The red carpet will be rolled out in Hot Springs on Saturday, September 21, 2013 for the premiere of “The Incredible Search for Jamie Klotz’s Diary” at the Mueller Civic Center at 7:00 PM. The independent movie, described as an adventure-comedy, was filmed over the course of four days this past May and stars a cast of current Hot Springs High School students and Hot Springs alumni. Directed and produced by 2007 Hot Springs High School graduate Justin Gausman, and co-written by Gausman and 2009 HSHS grad Daniel Crossman, “Jamie Klotz’s Diary” tells the story of Jamie, a teenage girl (played by Aspen Watts) whose diary is stolen by a professor (Michael Minor) and his two protégés (Isaiah Crossman and Sam Martin) who believe that the diary holds the secret to the location of an Old West treasure. The film was produced as a self-challenge piece for Gausman in between his work on a forthcoming documentary about the Save the VA effort in Hot Springs. Hot Springs locals might recognize community landmarks in the film, such as the Evans Plunge, Pioneer Museum, Public Library, the train depot and the waterfall. The prominent inclusion of these landmarks was intentional, according to Gausman. Admission is free to the premiere of the 70 minute film, and the program will include the movie, a Q&A session with the cast and crew, and a brief presentation on Gausman’s future projects, including the Save the VA documentary. The cast includes Aspen Watts, Okoye Zimiga, Bridgett Hill, Daniel Crossman, Michael Minor, Matthew Luebeck, Isaiah Crossman, Sam Martin and Garett Jack. The film is appropriate for all ages.